40m/131ft superyacht LADY M is a glamorous Sunseeker planing vessel constructed with a lightweight GRP hull and superstructure in 2018. 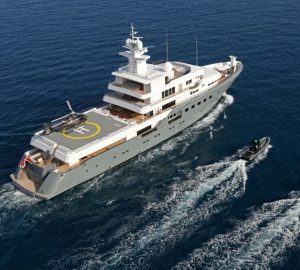 The shipyard is also responsible for her naval architecture, while Vickers Design Studio created her beautiful modern interiors. The accommodation sleeps 10 guests over five cabins and has a 12 pax capacity while cruising, served by a crew of eight. The sizeable swim platform can be used for sunbathing and provides easy access in and out of the water. The stairs lead up to the main deck where a sofa is integrated into the stern and a raised table creates an ideal alfresco dining area under the shade of the upper deck overhang. On the foredeck, a spread of sun pads covers the area in front of the helm station and towards the bow a C-shaped sofa and drinks table creates a comfortable area to relax in the sunshine with uninterrupted views. The upper deck is designed for outdoor socialisation throughout the day and the extended sundeck shades the area below. Close to the sky lounge an alfresco dining table seats up to 10 guests in the fresh air, and two L-shaped sofas along the stern with drinks tables for large group gatherings. The sundeck provides the best views on board and the aft is lined with sun loungers for another excellent spot to rest in the sunshine. The interiors use a breath-taking combination of black gloss surfaces and matte white upholstery for sophisticated and welcoming environments perfect for a special occasion or a casual family break. The lower deck contains the majority of the guest accommodation, which consists of two VIP staterooms and two twin cabins convertible to doubles. The Master suite is placed on the main deck to take advantage of the full beam and greater natural light with comfortable seating placed beside the full-height windows and a large minimalist bathroom. The main salon features a raised ceiling and contains a grand forward formal dining table to seat up to 10 guests to a lavish meal in an intimate environment. To the aft, the lounge benefits from floor-to-ceiling windows, and two sumptuous sofas and additional armchairs are arranged around a central coffee table to make an ideal conversational area. The upper deck offers another lavish internal guest area with the sky lounge; similar to the main salon, the ceiling has also been raised for a greater sense of space and floor-to-ceiling windows ensure that guests can observe the glamorous city or natural scenery while savouring a cocktail from the bar. Seating is placed around drinks tables for close conversation in small groups. Twin MTU 12V 4000 M93 engines produce a top speed of 23 knots, a cruising speed of 17 knots and a range of 2,000 nautical miles. Five luxuriously-appointed and lavish suites accommodate up to ten charter guests. The cabins, each with its own ensuite bathroom, include one large Owners suite with a 180cm-width bed, two double cabins with 150cm-width beds and two convertible twin cabins with two single beds each. Each suite has a unique colour scheme and styling. 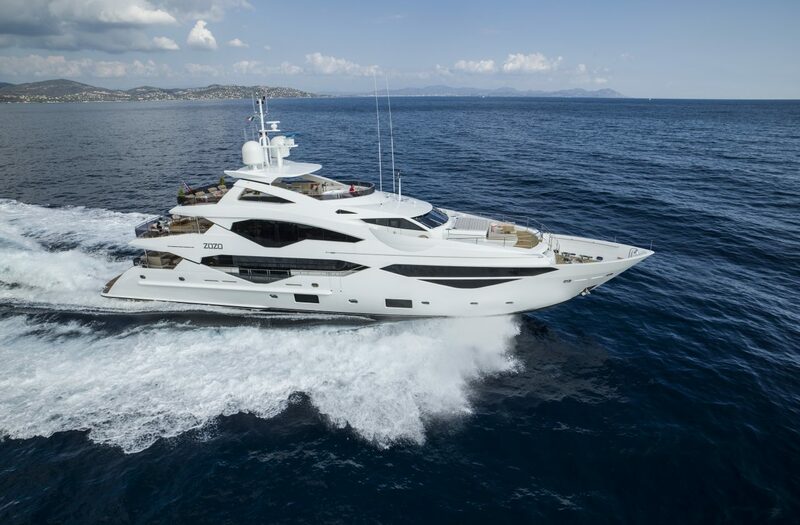 The expert crew of 8 will provide everything guests require for an exceptional holiday.